Some of the comment on this review comes from the review of "Light Flight - The Best Of Pentagle' as some of the tracks are on this album and the basic general introduction/track detail is not in need of change. 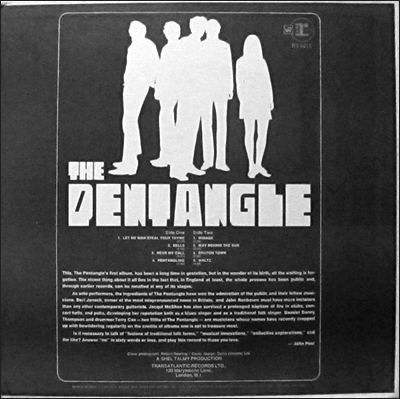 Pentangle were a British folk rock band who had their best period in the late sixties/early seventies. They were largely folk-based but had influences of blues, jazz and rock in their music too. The differing eclectic nature of their music can be clearly detected across this album. The traditional folk of "Let No Man Steal Your Thyme" is a very Fairport Convention-esque track, with Jacqui McShee providing haunting, medieval-style vocals, whereas "Waltz" is an instrumental packed full of jazz influences - stand up bass, jazz drum rolls and lively keyboards. 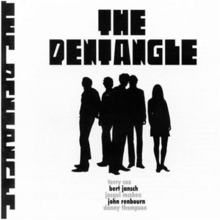 It is on tracks like this that Pentangle differed from many other folk groups. "Bells" is a catchy, acoustic guitar and drums based instrumental. The stereo sound is truly fantastic, particularly for 1968. There is a drum solo on it too, which was highly unusual for an ostensible folk group (although they were never just that). The haunting voice is McShee is back on the beautiful, ethereal folk of "Hear My Call". McShee was the match of Sandy Denny, for sure. Again, the track's eclecticism is highlighted by a killer bit of blues guitar. "Pentangling" is a lengthy, almost "jam" style track, with some airy McShee vocals at the beginning before it proceeds into a virtuoso workout of acoustic guitar, percussion and bass. The vocals do return with a bit of a change of pace. It is all very late sixties but none the less instrumentally impressive. 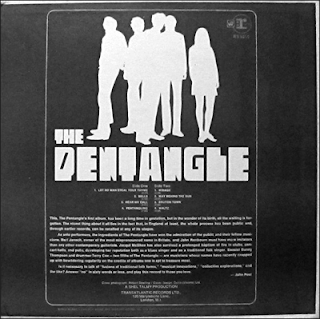 "Mirage" is a short, laid-back, percussion and vocal-dominated song, while "Way Behind The Sun" shows the group's love for the blues. It is packed with blues guitar and a lively Joplin-esque vocal from McShee (although far less throaty). "Bruton Town" is a traditional folky air, with McShee and Bert Jansch duetting most hauntingly. The bit where it goes quiet and the guitar and drums interplay is excellent. The musicianship is of the highest quality. This is a most impressive debut from a group that, outside of folk cognoscenti, are surprisingly little mentioned. I find their ambience, sound and blend of styles both interesting and beguiling.